This tutorial describes using the SchemaMapper transformer. This transformer converts the existing schema of features to a new structure, based on mappings defined in an external lookup table. This technique is very useful when the mappings are complex, repetitive or when they need to be maintained by someone who is not familiar with FME. Schema is the structure of the dataset. Each dataset has its own schema which is a physical representation of the data. Schema primarily defines the feature type name, attribute names, attribute data types, and permitted geometry type. The source schema is “what we have” and the destination schema is “what we want to get”. The act of connecting the source schema to the destination, to fulfill the “what we want” aspect, is called Schema Mapping. Schema Mapping can be done through common transformers within a workspace and examples include the AttributeCreator, AttributeCopier, AttributeRenamer and AttributeValueMapper transformers. 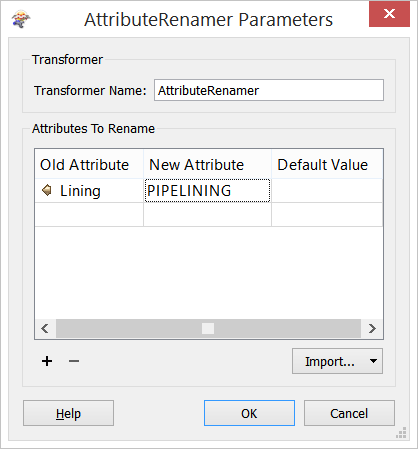 To rename attributes on a destination Feature Type, edit the attribute name on the Feature Type and then use an AttributeRenamer Transformer to perform the Schema Mapping. This process works well for simple transformations but when mappings are potentially complex, repetitive or when they need to be maintained by someone who is not familiar with FME, then the SchemaMapper transformer should be utilized. This transformer converts the existing schema of features to a new structure, based on mappings defined in an external lookup table. Using a table to define these mappings simplifies the completion of these tasks. The schema mapping lookup table, used by the SchemaMapper transformer, defines a series of conditions that are to be met (filters), and a series of actions that will be executed when the conditions are met. The lookup table may come in different formats such as: a comma-separated or plain text file; a spreadsheet (Excel or Google); or as a table in a database such as Oracle, PostGRES, Informix, SQL Server, etc. A new attribute is created whose name and value are defined in a lookup table. 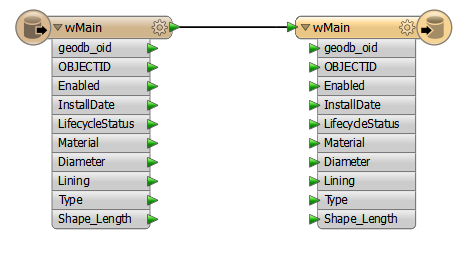 Powerful: Contains the ability to map attributes, attribute values, and Feature Types, all from within a single file external to the FME Workspace. 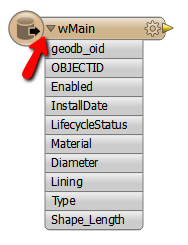 Flexible: Non-FME users can update the process by editing the lookup table directly outside of Workbench. Efficient: Multiple source Feature Types can be routed into the same SchemaMapper to provide simultaneous mapping functionality. Extendable: New data can be handled by editing the lookup table – and not the workspace. User-Friendly: Allows most mapping to be handled by a single transformer. The non-SchemaMapper method may involve a combination of many Tester and/or AttributeValueMapper transformers to handle all of the individual conditions and lookups. The SchemaMapper requires an external lookup table in order to be configured. This article contains a description of creating the lookup table as well as connecting it to the SchemaMapper. Attribute mapping is when one or more attributes on a feature are mapped by renaming their existing attribute name(s) to a new one. This article demonstrates the design of a simple lookup table and how it can be used to map attributes. 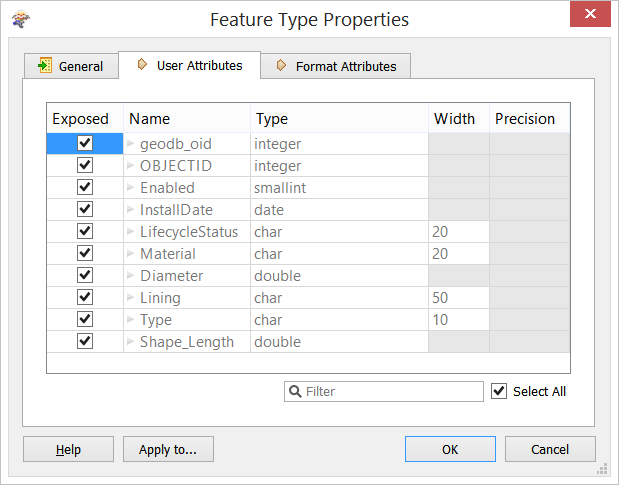 Feature Types Mapping is when one or more Feature Types are mapped to a new Feature Type and renamed. This article demonstrates how to perform Feature Type mapping using a lookup table. Conditional mapping makes use of the SchemaMapper’s conditional filtering capabilities. It is a way to define a simple clause to perform attribute mappings based on specific conditions. This article describes how to map schema based on the value of attributes within the Feature Type. This article describes how to use the SchemaMapper’s conditional filtering capabilities to define a clause in order to map Feature Types based on the value of attributes within the Feature Type. An article which demonstrates some of the advanced uses of the SchemaMapper, including the use of multiple clauses to filter features, how to add new attributes and how to modify existing attribute values. The article also discusses the order of entries in the lookup table, which is useful for debugging. How to generate lookup tables using data sourced from input feature types is discussed in this article. SchemaMapper Description: see FME Transformer Helpfile.